1. 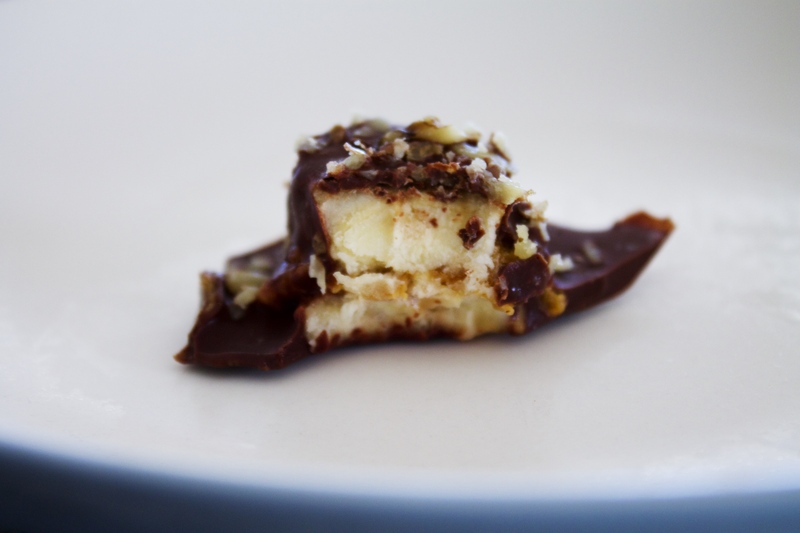 Melt your dark chocolate in the microwave in 30 second increments, alternatively you can do this using a double boil method on the stove top. 3. 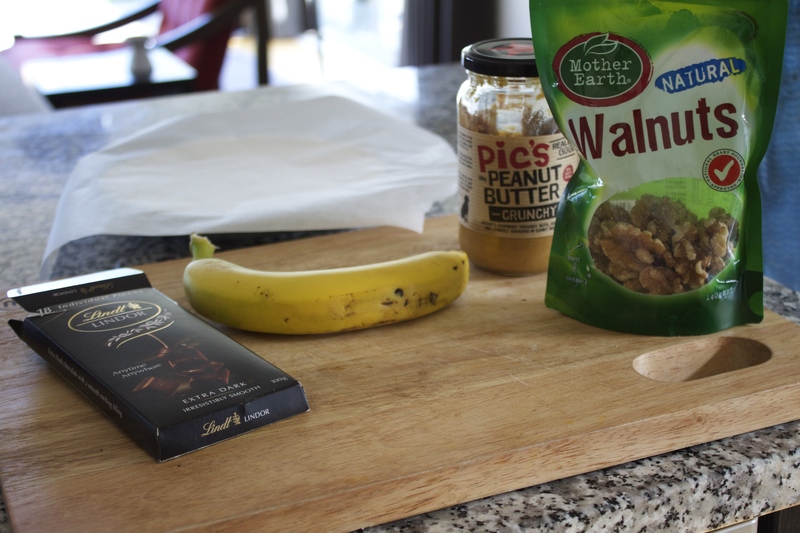 Place a dollop of your nut butter of choice on top of the banana. If you’d prefer, you can leave this step out. 4.Place a slice of the banana on top to make a little sandwich. 5. This is where it gets a little messy. Place a sheet of baking paper on a tray or plate and put your banana sandwiches on top. 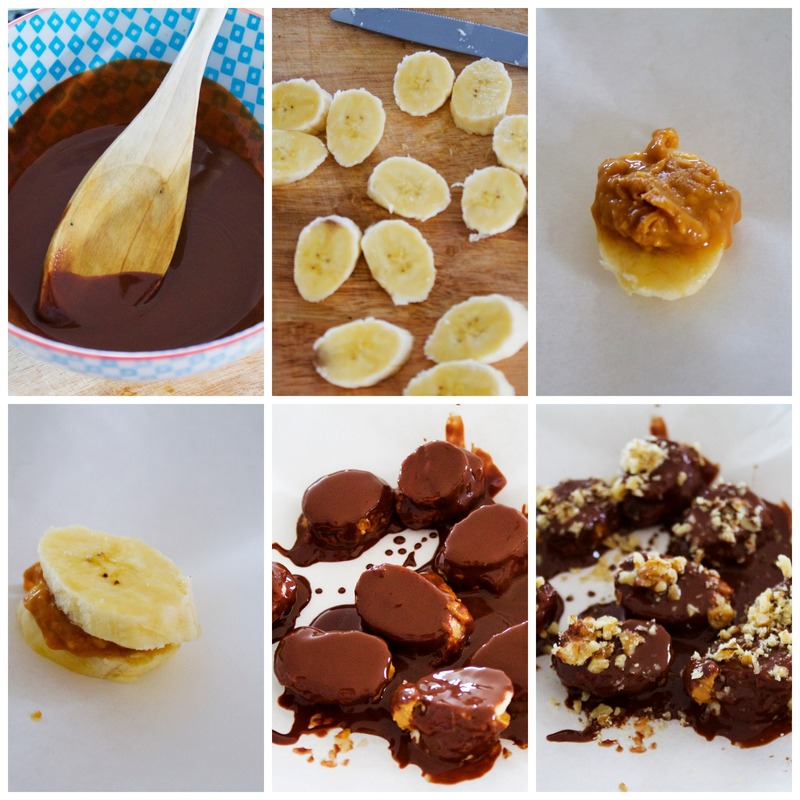 Pour your dark chocolate onto the banana, so that they are covered evenly. 6.Add the topping of your choice, this is also optional. I decided to put some chopped walnuts on mine, but you could also use almonds, sprinkles or coconut flakes, the skies the limit with these. 7. Finally place in the freezer for at least 1 hour. You’re left with these gorgeous little bites. When the banana freezes it take on a ice cream like consistency and creaminess. If you close your eyes you pretend that this sweet treat is a lot more naughty than it really is. I feel a little bad making this into a recipe as it is incredibly easy, but they are so yummy I couldn’t keep these to myself. 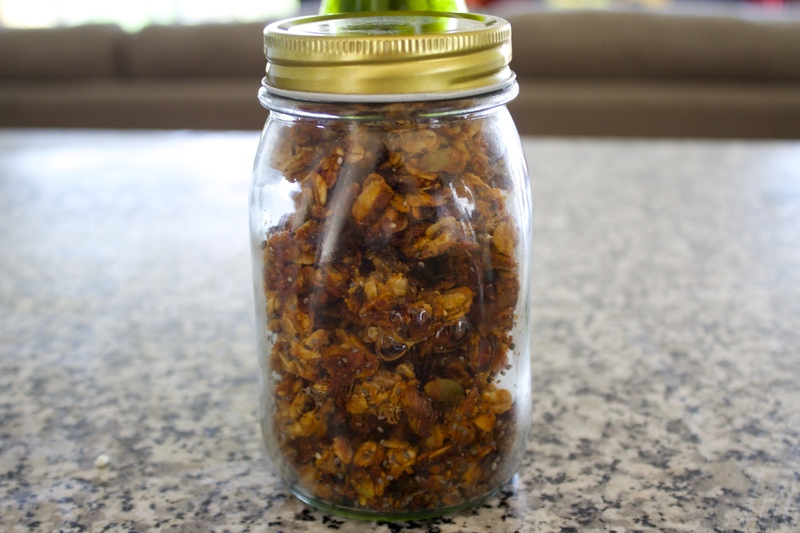 Sprinkle in your favourite nuts and seeds, I use a mixture of Pumpkin seeds, Walnuts, Slivered Almonds, Sesame Seeds or feel free to pop some Goji Berries or Dried Cranberries. Mix the Honey, Maple Syrup and Peanut Butter in a microwavable bowl. Once mixed well microwave for 20 seconds and stir again. Add in the Chia Seeds, Vanilla Extract, Cinnamon and the salt and stir well. Place the wet ingredients into a larger bowl make sure to use a spatula to get as much of the mixture out into the new bowl. Add in the oats, make sure to add a little at a time, to ensure the oats are covered completely with the wet mixture. Next add in your desired extras. If you find it’s a little dry add in a little more Honey and Maple syrup to the mix. Spread the mixture evenly over a baking tray covered in baking paper. 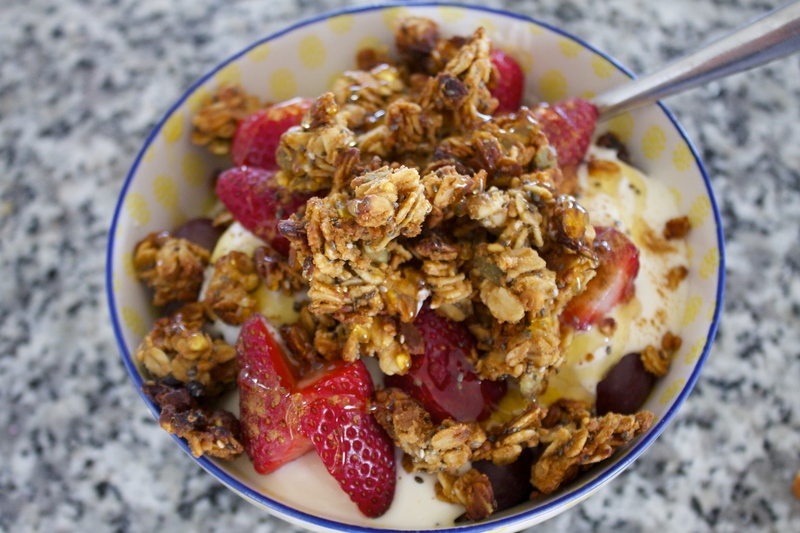 Place in the oven and cook for 15-20 mins, turning the granola over half way through. Be sure to keep and eye on it as it tends to burn pretty fast. So there you have it! I like to have mine with unsweetened natural yoghurt, chopped pears, grapes and strawberries and a little drizzle of honey. It would also be amazing as a parfait, in a cute glass with lots of yummy berries in between. 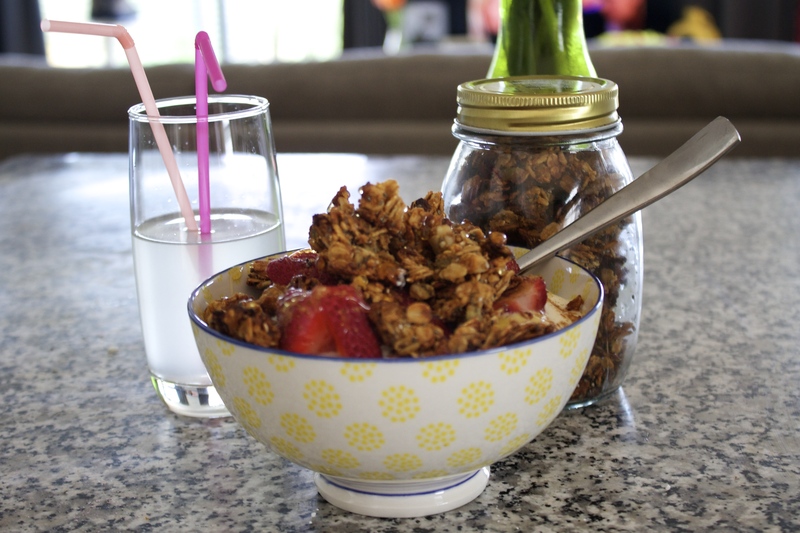 Enjoy with a glass of coconut water and you’re set for the day. It certainly is winter. I woke up to a mere 1 degree Celsius this morning and boy was that a shock to the system. As I am unable to provide you all with a D.I.Y this Friday because I’ve been pretty busy with my day job and life. 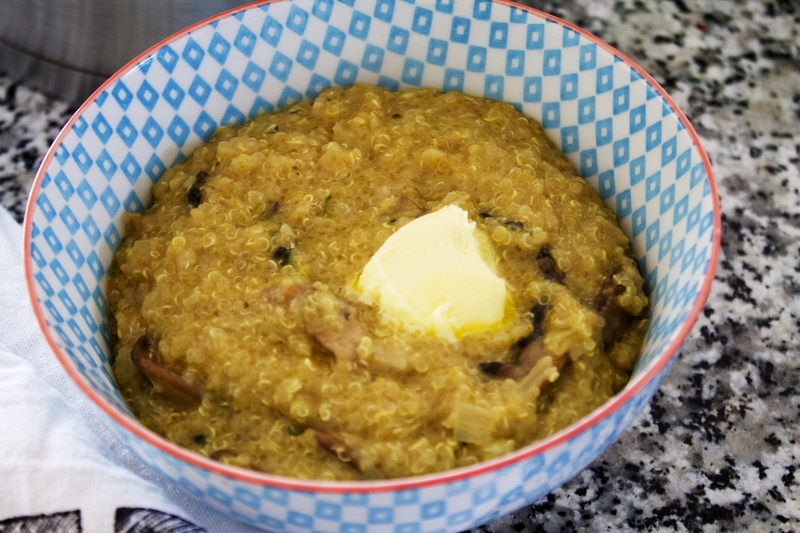 I thought as a little consolation prize I’d post the recipe for the chicken soup featured in my What I Ate Tuesday post here. However, I have a few D.I.Y projects on the go as I type, so fingers crossed there will be something new on it’s way soon. I must give credit to The Gracious Pantry here, for the recipe. I’ve used this original recipe as my base and tweaked it here and there to suit our personal tastes. I do love this website when I’m wanting to make something I know will be clean and will fill my body with goodness. I’ve also had a cold/virus on and off for the last month and quite frankly I’ve had enough. This soup has been my saviour for lunch time when I’m feeling poorly. 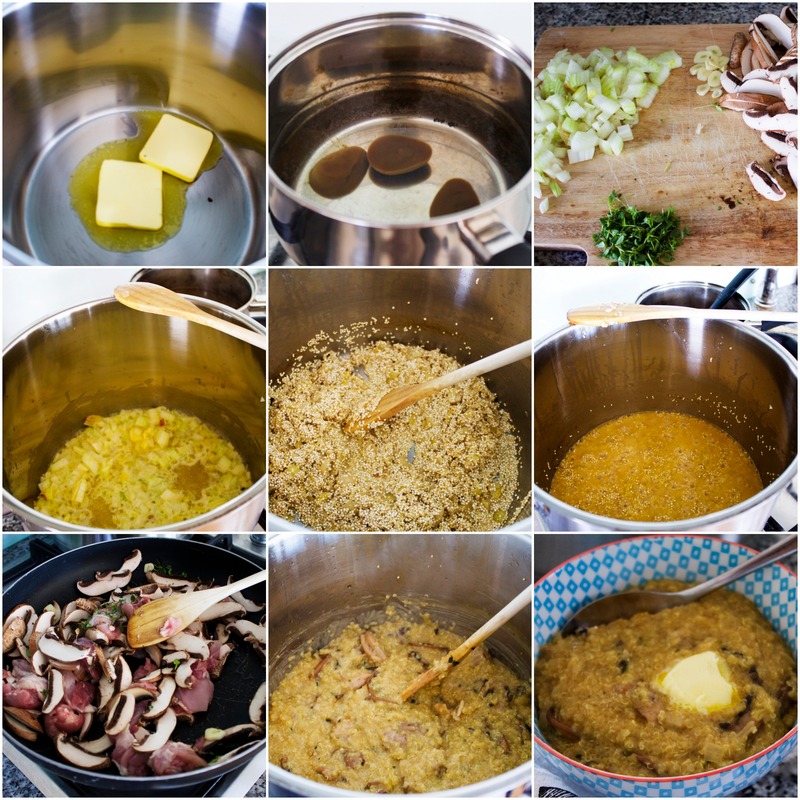 As I mentioned in my last post I usually make a huge stock pot of this soup and then keep in the fridge. A big pot usually lasts the whole week and I’m told by Chris that it’s even better warmed up the next day. I’m also not the greatest with measurements when I cook. I tend to do it Jamie Oliver Style and bish, bash, bosh it in. So I’m going to try my best to make it as accurate as possible, but like all recipes just adjust it to suit you. Using a wok or a non stick pan,sauté the onions, garlic, leek, cabbage and carrot for around 6-8 mins, in the coconut oil. Just to soften the onion,cabbage and leeks. Be careful not to over do it as I have on a few occasions, burnt garlic taste is never nice. Place the wok to one side and retrieve your stock pot. I got mine (as pictured below) here from Briscoes. Amazing value when you can pick one up in the never ending sale. Measure out the water and add your stock, My favourite stock is available here at Countdown. Its quite pricey but really worth it. *I have used the cheaper alternatives, like Maggi Stock Melts and the do work well too. Or if you’re way more skilled than me, make your own. Bring this to a slow shimmer. Once the stock is shimmering away, add in your vegetables from the wok. Don’t add in the celery or sweetcorn just yet. Also add your Garlic powder and Marjoram. Cook these for 30 mins. Then add in the diced chicken breast and your celery and cook for another 30 mins. Finally add the sweetcorn, in the very last 5 mins so that they retain their crunch and juiciness. Add Salt and Pepper to Taste. The original recipe uses parsnip, although I wanted to leave this out as I following the 17 day diet and therefore wanted to keep within the plan. 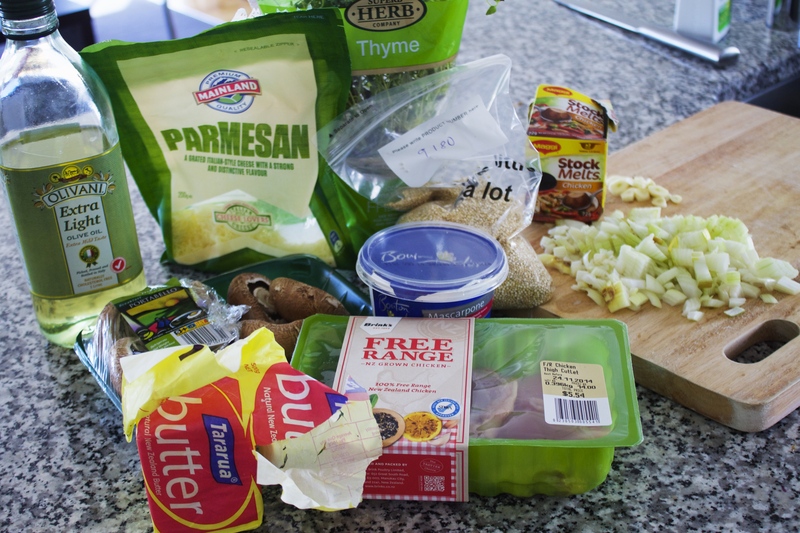 It also suggests to add noodles or brown rice. I substituted the noodles with cabbage to bulk it out and have also put this with cauliflower rice as another great, clean alternative. You could also go ahead at add some courgette noodles too if you’re feeling fancy. I hope this makes some sense, as I’m not quite used to this whole recipe writing game and you all give it a try, Stay warm and toasty!